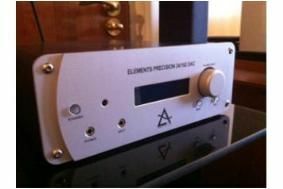 BRISTOL SHOW 2011: Leema Acoustics announces Elements series | What Hi-Fi? Sporting a trimmed-down chassis with a narrower profile than we've seen previously, the range includes an integrated amplifier, CD player and DAC – and there's a streaming device in the pipeline. The Elements integrated stereo amplifier delivers 45 watts per channel and has three RCA analogue inputs, a set of XLR balanced inputs, a 3.5mm minijack input and a preamp output. The amp's on-board DAC sports three digital optical inputs, plus coaxial and USB connections, and a headphone amp, too. Talking of DACs, Leema's Elements DAC promises 24 bit/192kHZ audio delivered over USB, plus a smattering of optical, coaxial and analogue inputs. Also in the Elements range is a CD player. Sporting dual balanced and unbalanced outputs (four XLR and four phono) to allow biamping, as well as digital outputs, too. A streaming product is promised, too, though we'll have to wait for more details on that. Set to retail at around £1000 per unit, the Leema Acoustics Elements series is due out early summer.